White paper on crime 2004 Part2/Chapter5/Section3/2. This subsection will give an overview of the trends of adult probationers and parolees. For juvenile probationers and parolees,see Part4,Chapter2,Section6-2 . Fig. 2-5-3-1 shows the trends of probationers and parolees newly received by probation offices. 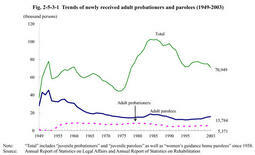 In2003,the number of adult parolees newly received was15,784,up by466from the previous year,and the number of adult probationers was5,371,down by17. Fig. 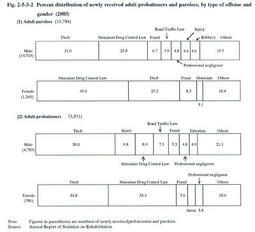 2-5-3-2 shows the percent distribution of adult probationers and parolees newly received in2003,by type of offense and gender.The percentages of those who committed theft and Stimulant Drug Control Law violations were high in both of probationers and parolees regardless of gender.The percentage for Stimulant Drug Control Law violations is higher for females,compared to males in particular.